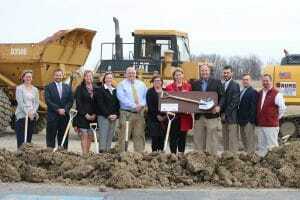 New Bremen, Ohio – March 29, 2019 – Officials from New Bremen Local School District, Gilbane Building Company, Garmann/Miller & Associates, Ohio Facilities Construction Commission and students recently came together to celebrate the official groundbreaking for the new elementary facility that will provide a modern learning environment for future generations of students in grades K-6. Gilbane is one of the most experienced builders in the Central/Midwest market and is currently one of the largest construction managers in the Columbus market. Our established relationships with area subcontractors/suppliers, local and state authorities, M/WBE contractors and top design and engineering professionals have resulted in satisfied clients and repeat business throughout the state. With more than 60 years of success in the highly competitive construction market, Gilbane is committed to continuing the strong tradition of excellence in the Ohio construction industry.